I blame Mary Katrantzou for our on-going fascination with all things patterned. The printed pencil skirt has been with us for a while now, and seems to be maintaining its grip on the fashion circle into autumn and winter. That's good news for us, as these skirts work well with bare legs or tights, when the colder weather settles in. One of the major champions of this look is Carine Roitfeld, who shows us that it's look for all ages. I have to admit that I was beaten by the polyester issue with this post, and could only find a couple of skirts which weren't made out of it - notably the M&S skirt and the striped ASOS number (my favourite). It seems that print and poly are committed bed-fellows. Shame. 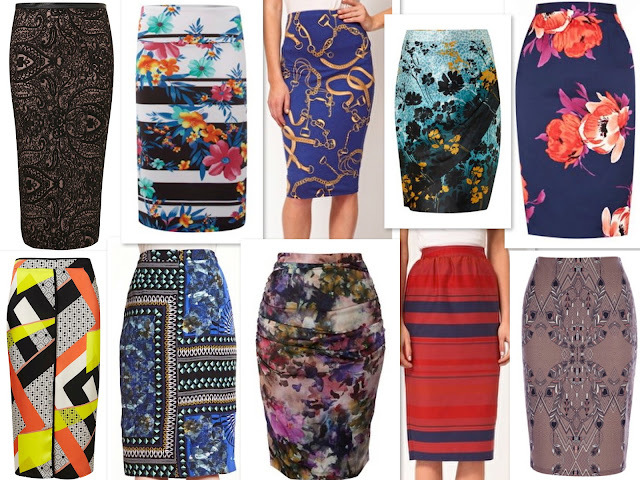 The number one accessory to go with these skirts? Heels. It's a brave girl who wears one of these bad boys with a flattie. A simple block colour vest or t-shirt will complete your look. Black Paisley tube skirt, £28 Topshop; Tropical print skirt, £10 House of Fraser; Chain print pencil skirt, £18 ASOS; Printed pencil skirt, £51 House of Fraser; Coast Cheyne duchess satin skirt, £85 House of Fraser. Scarf print slip skirt, £40 Topshop; Autograph floral frame pencil skirt, £49.50 M&S; Caravaggio skirt, £129 Hobbs; Stripe pencil skirt, £18 ASOS; Peacock mirror skirt, £40 Oasis. It depends on "the more you print, the lesser is your cost". In the event that standard weight paper or shading paper are utilized, at that point it requires a high print run which may shift its cost.